Around 1,200 law enforcers are minding public order. 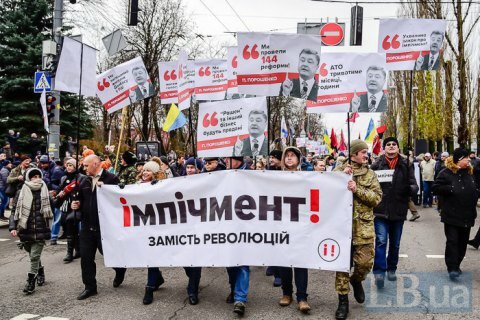 Supporters of Mikheil Saakashvili's Movement of New Forces have held a march in central Kyiv, entitled "March for Impeachment". According to the press service of the Interior Ministry, around 2,500 took part in the event. Police stepped up security measures in the city centre, with around 1,200 officers of the National Police and the National Guard minding public order. Media gave various estimates of the number of protesters, from 3,000 to 6,500, many of them people of older age. The Movement of New Forces put up a tent camp outside parliament on 17 October, demanding that MPs lose their immunity from prosecution, establish an anticorruption court and introduce a proportional electoral system based on open lists. Later they also demanded a law on impeachment.